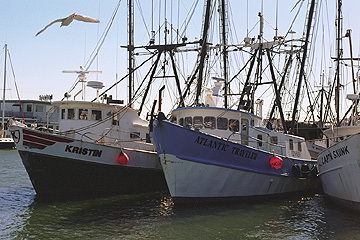 Located midway on the New Jersey coast, Point Pleasant could be used as a textbook example of a traditional fishing community existing in harmony with the surrounding tourist dependent businesses. With a fleet made up of medium sized otter trawlers and a few gill netters, the Fishermen's Dock Cooperative has third generation fishermen as active members. The Point Pleasant boats fish primarily local waters, making trips of from one to several days in duration and landing fresh, iced fish. The major species sought are fluke, squid, silver and red hake, and scallops. The very large surf clam fishery was pioneered in Point Pleasant and one of the first processing plants using steam shucking was built there. In recent years an increasing number of hydraulic dredge-equipped vessels have been targetting surf clams and ocean quohogs from Point Pleasant as well. Like Atlantic City, Point Pleasant no longer has any processing plants and the clams are trucked elsewhere after landing.